It took us forever to get around to going on our date from the date basket in March. I had planned two dates and only one happened... and it technically happened on April 1! We will just bump the other date into April too! This months date was to Canton Trade Days! It is a large flea market that takes place the weekend of the first Monday of every month in Canton, Texas. In his envelope I included the info sheet describing the date, a couple of maps, some spending money, and some "taco dólares" (probably not proper Spanish but he got the idea!) for the $1 taco stand that David loves! I knew this date was not something David would be jumping for joy to go on.. He has a good time when we go but I am the one who enjoys digging through piles of junk treasures!! So I bribed David with the food- I think he ate about 4 times while we were there! I was pretty lucky with my finds Sunday! I have been on the hunt for a great old wooden ladder to put in our living room to hold blankets. I wanted a more primitive ladder that just leaned on the wall but couldn't find one at a decent price. I was able to pick up this old wood ladder for only $10. We also found a great metal globe! Not sure where we are going to put it for now but we both loved it and couldn't pass it up! Another fun find was this metal orb. 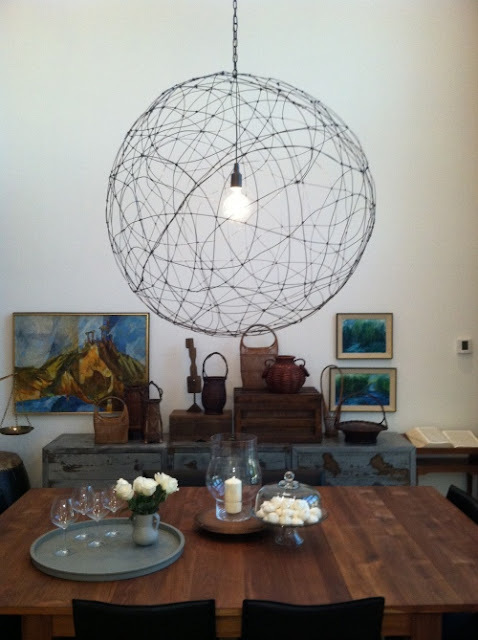 I am hoping one day to make an orb light fixture similar to this one. But that will have to wait until we actually have a place for this large of a light! We had a lot of fun, found some other great things, and got a little sunburned. Overall it was a great weekend! What are some of your favorite flea market finds?